I just found this website the other day and decided to join. My name's Jeff, I live in Western PA and I'm 41. 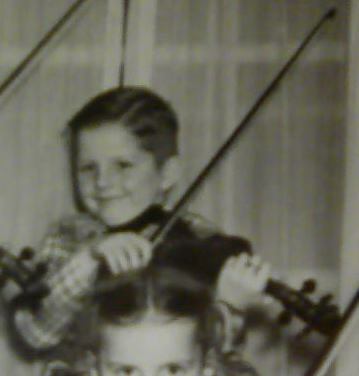 I used to play violin--started in fourth grade (1980), but stopped after I finished high school--I picked it up a few more times when requested, but haven't touched it at all the last 20 years. About a month or so ago I found it while looking for something else in my closet and decided to take a a look at it. Other than the bow needing re-haired and it badly need restrung (the A string was starting to unwind at the nut), it seemed ok.
Last week I got a cheap set of strings (Super Sensitive Red Label) and a cheap bow and discovered that my intonation wasn't that bad... RUSTY, but not bad. WHtsUP Jeff > The STEELERs sucked this year > Pittsburgh here>>> north of the city now days > Freaking cold outside. > I just picked up the fiddle over xmas 2012 > Found my daughters student type and started messing with it. > IT IS SWEET!!! > Been playing it alot > Learning all kind of things > Stay with it > too freaking cold outside to do much else > great time to do it. Welcome aboard Jeff, I'm sure you'll love it here. Only been a couple days since I decided to become 'Active' on here and already learning a bunch more than before I signed up . Good luck on your continued journey! Welcome, Jeff...... Sound's like you already have a pretty good handle on this violin thing. The pack depends upon the wolf, and the wolf depends upon the pack. The loss of one means the destruction of the other. Thanks for the warm welcome! Hopefully the weather will cooperate soon. Welcome to the forum Jeff. Always great when we get former fiddlers back on the fiddle. Is it like riding a bike? Hope to see a lot of you around here. Have fun rediscovering your instrument. Welcome to the forum, Kanegs! Fiddlerman, it's amazing how much the fingers still remember after all these years. I can play parts of songs that I no longer have the sheet music for. My bowing is pretty bad. Not sure how much is me, and how much is not liking the sound of steel strings (the set I replaced were Pirastro Exdoxas). I seem to get those odd harmonic-like sounds quite a bit. Right now, my immediate goal is to keep playing--and have fun. Welcome, Jeff! Glad you found your way back to the violin and the way to this site. Looking forward to hearing about where you go from here.